The coiled filament operates at ~800°C when powered with 4 watts for the IR-21 and 3.4 watts for the IR-22. The radiating element is a coiled resistance wire which has a high emissivity in the infrared spectral region. The coil is supported on a cylindrical substrate of alumina. Due to the reduced mass of this unit it can be pulsed at up to 1 hertz with a resultant temperature variation that can be detected though the depth of modulation is small. For electrically modulated infrared light source operation please see the pulsable sources. The unit does not require operation in a sealed atmosphere. The header is available in two sizes. The larger, IR-21, has an 8.6 mm (0.341 in) diameter base. The smaller, IR-22, has a 4 mm (0.157 in) diameter base. 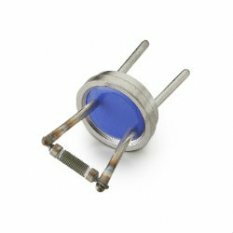 The support pins, which are also the power leads, are hermetically sealed in glass. The IR-2X Series is offered in two configurations: the IR-21 and IR-22 have the element mounted horizontally and the IR-21V and IR-22V have the element mounted vertically.